Stalag 17 (1953), the riveting drama of a German prisoner-of-war camp, was adapted from the Broadway play directed by José Ferrer in 1951. Billy Wilder developed the play and made the film version more interesting in every way. Edwin Blum, a veteran screenwriter and friend of Wilder's, collaborated on the screenplay but found working with Wilder an agonizing experience. Wilder's mordant humor and misanthropy percolate throughout this bitter story of egoism, class conflict, and betrayal. As in a well-constructed murder mystery, the incriminating evidence points to the wrong man. 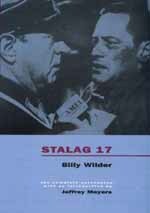 Jeffrey Meyers's introduction enriches the reading of Stalag 17 by including comparisons with the Broadway production and the reasons for Wilder's changes. Billy Wilder was born in 1906 near Cracow in Polish Galicia, then part of the Austro-Hungarian Empire. His first career was journalism, but he soon moved into the German film industry as a scriptwriter. When Hitler came to power, Wilder fled to Paris and came to Hollywood in 1934. His fifty-year career there—as both director and cowriter—was one of astonishing versatility and genius, encompassing films about war, murder, alcoholism, Hollywood, sensational journalism, prison camps, criminal trials, love stories, and romance as comedy. Billy Wilder has been nominated for twenty-one Academy Awards and has won six Oscars. He lives in Los Angeles. Jeffrey Meyers, a renowned biographer, has written many books and articles on modern American, English, and European literature. He lives in Berkeley.